Jenn-Air manufactures luxury kitchen appliances known across the nation for innovative features, beautiful designs, and unparalleled performance. In 1961, the company invented its legendary downdraft cooktop, and ever since has remained an innovator in the home appliance industry. The company’s wide range of cooking appliances includes ovens, cooktops, and cooking ranges as well as microwaves, range hoods, full-sized and specialty refrigerators, and freezers. Jenn-Air also produces dishwashers to help you maintain spotless dishes and cookware, and trash compactors to eliminate waste in your home. Jenn-Air appliances offer innovative technology with elegant designs. The brand is known for its modern, streamlined aesthetic, offering exceptional luxury in every appliance. Jenn-Air appliances boast a wealth of features and capabilities you won’t find from other brands, providing the power you need to achieve amazing results in the kitchen. The company also offers exceptional customer support to help your appliances last for years to come. Thanks to a wide range of sizes, styles, and designs available, you’re guaranteed to find a Jenn-Air appliance that meets your needs. For exceptional quality and innovative technology, consider Jenn-Air. Universal Appliance and Kitchen Center boasts a great selection of Jenn-Air kitchen appliances, helping you find the perfect addition to your home. Be sure to browse our exceptional selection of luxury cooking appliances today. 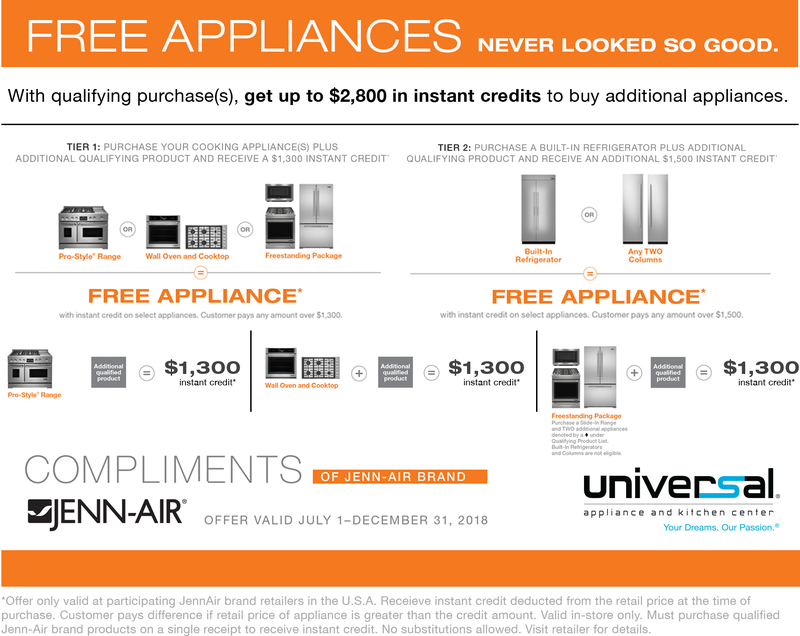 Receive up to a $2,800 rebate with purchase of qualifying Jenn-Air Appliances. Tier 2: Purchase a built-in refrigerator plus additional qualifying product and receive an additional $1,500 instant credit.